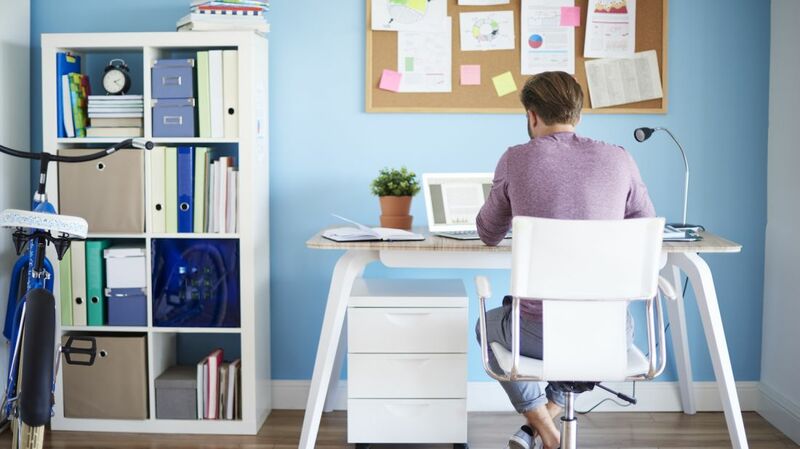 Whether you work from home full-time or use your home office to catch up on nights and weekends, having a clean, orderly place to get down to business is key to actually getting stuff done. We spoke with Erika Salloux, a professional organizer and the founder of Living Harmony, about the items you need in your home office to maximize your productivity and minimize clutter. Stop trying to get work done from the couch: Typing away with your laptop on your lap not only makes it difficult to focus, it puts strain on your back and neck. “A really good desk is really important and it should be the right size for the space that you’re in,” Salloux says. And she recommends skipping the huge desks with tons of built-in drawers, dividers, and file cabinets—all of those can be purchased separately to best suit your needs. “Just a simple, table-top desk, and you can add whatever you want to it,” she says. When it comes to chairs, go armless, Salloux recommends. “When you have arms on a chair, people don’t sit up straight; they lean on the arm. Then they’re leaning forward and they’re doing their body a major disservice,” she says. Also, for the most ergonomically friendly choice, pick a chair with an adjustable height—not one that belongs at a dining room table. In order to keep clutter at bay, Salloux says you need to stay on top of your paper. She recommends using what she calls the FAT system—each time you find yourself holding a piece of paper (a piece of mail, an invoice, a report, etc.) decide whether you should file it, act on it, or toss it. Use desk trays to store papers you need to act on. “I recommend ones that stack on top of each other and that open the longer way, like the landscape way. The way where the paper goes deeper in,” Salloux says. She recommends four trays: one for business-related papers, one for anything personal (your kid’s permission slip, a wedding invite you need to respond to), one for bills, and one for “pending” items—things you’ve acted on and are awaiting a response. Salloux swears by Smead FasTab hanging file folders, which have the tab built right in for easy labeling. For the T portion of Salloux’s FAT system—toss—you need a quality paper shredder. “Use a cross shredder not a strip shredder,” she says, and “shred right away” so papers don’t pile up. “The other thing that I also see that people don’t have in their office that they really need is some sort of supply organizer that’s within arm’s reach,” Salloux says. “Something where they put all their things like their stickies, their tape, their paperclips, stapler, scissors.” You can waste valuable time rooting through your desk for a paperclip or sprinting to the kitchen for a pair of scissors, so keep everything you need close at hand in one neat spot. Anyone who has ever lost a report the night before a big presentation or their whole album of vacation photos knows how important it is to back up your files. But here’s a friendly reminder that a backup hard drive is a necessity. “In addition to a hard backup drive that lives in your office you should have a cloud backup as well,” Salloux says. We’d never heard this piece of organizing advice before and now can’t believe we’ve lived without it: Keep a second power cord and any other cables you need for your computer in a bag or case next to your desk. “You don’t want to have to unplug all your cords, go under your desk and pull them all out, every time you go on a business trip or go somewhere to work,” Salloux says. If you work primarily in an office but bring a laptop home to work frequently, keep one set of cords at work and one at home. Salloux tells us printing should be easy—so why add the extra step of having to plug your computer into the printer every time you need to? Salloux is a fan of making lists in order to help stay focused. “I think that it helps people stick to the most important tasks as opposed to the easy stuff,” she says. There’s no one right way to create a to-do list (here are seven ways experts recommend), but Salloux says it’s best to find a system that keeps you accountable for tasks that are important but not particularly urgent. “That quadrant is one that we a lot of times have trouble with,” she says.